As much as K desires to continue to fly under the radar (autism stigma, anyone? ), she was happy to hear about this blog piece. She wants her story known. Mom, here, wants her daughter to finally feel free to be open to the world about who she is. But she isn’t there yet, preferring to keep her face hidden, symbolic of so many females who mask their own Asperger ’s day in and day out. We need a shift in thinking. We need to create an environment that allows them to safely be who they are, without question, without questioning them, without invisible masks. As time is not on my side this week, I’ve decided to provide you with an edited excerpt of a letter I sent to someone my daughter studied under, who champions women’s issues on a global scale. I hope it will provide you with insight to our backstory, and to encourage you to share your own! As always, please comment below with any questions. “K mentioned to me she confided in you about the book we wrote, “Asperger’s in Pink,” (Future Horizons). As she hands you a copy, I wanted to address why the book was written in order to provide some perspective before you read it. When K was diagnosed in the early 2000’s, there was very little known about Asperger’s (Autism Spectrum Disorder: ASD) and girls. Much used the vernacular of “he, him, son,” etc. Doing so alienated many readers/parents with daughters. Despite many diagnostic overlaps between all sexes, this alienation needed to be addressed. As a family, we decided to move forward with a book to do just that. 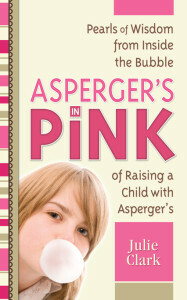 “Asperger’s in Pink” was born. As for the title, we purposefully used “pink” in an effort to draw attention to the fact females, are, indeed, on the Autism Spectrum. When we first started out, it was thought that the ration of boys to girls with autism (Asperger-end) was 10:1. Now, most experts in the field speculate it is closer to 2:1, or even 1:1, but the exact ratio remains obscured. Much of this stems from using a gendered lens that skews pretty much everything. Despite our book’s focus on raising a daughter on the spectrum, readers have commented they see similarities with…sons. In fact, one of my readers has commented she has both a son and a daughter with Asperger’s Syndrome and that her son related more to the book than her daughter. I found this very interesting and crucial as although there is usefulness in noting differences between the sexes, we must not draw such a bold line between the two. Not all girls are quiet and meek. Not all boys love trains and presidents. And that’s ok. That’s as it should be. 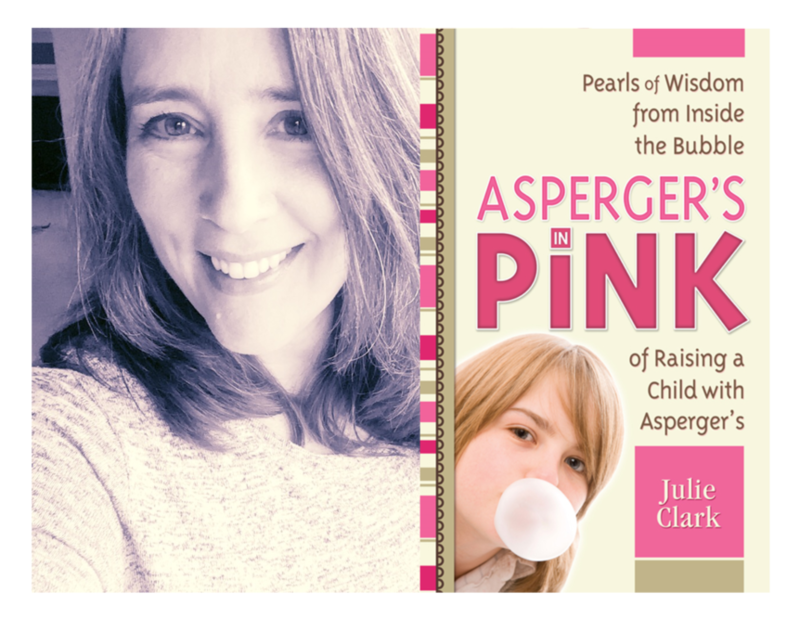 “Asperger’s in Pink” was an attempt to shed light on females on the Autism Spectrum, and it succeeded. It was one of the first of its kind published. K has experienced firsthand the biases inherent in teachers and other professionals who compared her to boys. On another note, the book was written in a format that is digestible to a wider range of readers. Most of the resources out there are written for college-aged readers, which does a disservice to those who are not at that level. In other words, this book was written to start conversations between those who may not have the resources to extrapolate data from other tomes. Regardless, thank you for the work you do to continue to pry open traditional ways of thinking. My daughter continues to battles gender expectations. She bristles at the way society at large prefers to see Aspies as nerdy white guys. Sure, there are plenty of Aspies who resemble such, and they deserve recognition. But it’s imperative we acknowledge those who do not fit that stereotype, too. With that in mind, here are two shout outs to women with autism who have made a difference. These shout outs include links to their work so you can read about them, in their own words. Liane Holliday Wiley for being one of the very first to share her story in print: Pretending to be Normal. Women should be free to be who they are without fear of retribution for the way they choose to live their lives, stand up for themselves, or think. Yes, think. Not all women like frills, monograms, and sappy movies. Women should be free to have Asperger’s Syndrome and leave the masks on the shelf. They should not be made to explain and then justify an Asperger’s diagnosis to those who only see autism in “blue”. As I said in my book years ago, we need to choose to look at souls, not faces. Or in this case, gender. Let’s move forward on International Women’s Day and recognize that women, too, have autism. Their stories are valid. So is their way of thinking. And these women often leave a powerful, positive mark on mankind. My daughter is an incredibly bright, strong woman who just happens to be on the Autism Spectrum, and she’s already changing the world.